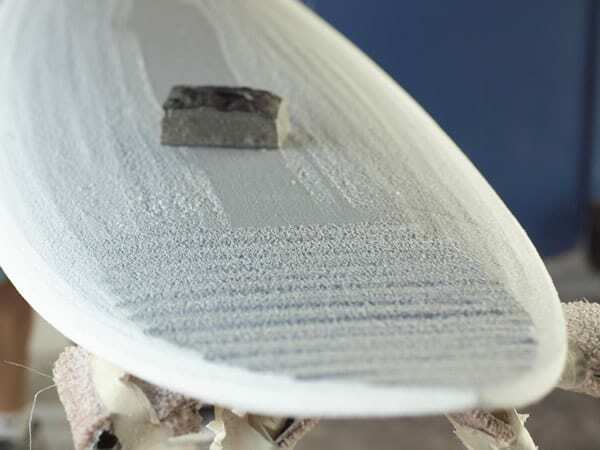 Today we are going to give you a detailed list on what different types of materials that can be in your surfboard. A small guide that will help you when buying your first surfboard, getting a second-hand surfboard or upgrading from your current surfboard; so you know what surfboard materials you should be looking for. Expanded polystyrene, also known as EPS, is mostly used for epoxy surfboards made industrially. More than 90% of its volume is occupied by oxygen, which makes it a lightweight board with ease of movement in the water compared to other surfboards. Two example boards that we´ve tried are the: Bull Ant from Agency and the Hypto Krypto. This material is made with a block of Polyurethane (PU) and is covered with epoxy resin. When finished, the board has the same look as the conventional models that we are used to seeing. The resin gives more flexibility and durability, while also giving the boards more resistance when facing torque. Approximately 80% of the boards made today are done with polyester. This is due to it being more practical and economical than epoxy resin. In the manufacturing process, the polyester is mixed with a catalyst so that the resin stays consistent. The catalyst can be liquid or ultraviolet. There exists different types of polyester, but in the surf industry, the most adequate ones are silma resin and UV H61. Both good quality. One of the most frequent doubts when buying a surfboard is choosing between conventional polyester and epoxy. The question is: How do I choose? Even experts disagree over which one to recommend, classic or epoxy? If we have to highlight a characteristic, it´s that polyester resin without a doubt offers more flexibility. Something that we make use of as much as possible when we are in medium and big waves. This type of material gives us more maneuverability in the board and at the same time better and faster response time in the water. It also stands out that these boards are cheaper. On the other hand, polyester resin boards have less floatability. In regards to epoxy made boards, we can say these are more lightweight and float more. Something that makes these good initiation models for surf beginners. These surfboards are ideal for small waves and their material guarantees more durability and resistance against blows and hits. They are also more resistant to color deterioration from sun exposure. All of this makes them more expensive than polyester. As for negative points, these boards are more rigid with less flexibility. What surfboard do I buy? To get to a conclusion over which type of surfboard is recommended for you, you have to take into account these different variables: Surf level, type of waves / predominant winds of your locality, faster boards, weight and also budget. There are many factors that influence when buying one board or another. Being a beginner, it can be a difficult choice to take since most of the questions you´ll be asked in the surfshop or by the shaper will be like another language to you. But with time and experience, it will result easier to know what material to choose to get the most performance from your board. Here we have a list on the main advantages that an epoxy board will have vs a polyester board. Structure: Despite both boards having the same structure, its interior is made with foam, the materials used are different. Epoxy boards are made with more resistant materials and are in continuous development. Resistance: This is one of the most important characteristics when choosing. Boards suffer a lot each time they go in the water. Conventional boards are known for their fragility given that with a few sessions you´ll start to see cracks around the board. Epoxy, on the other hand, has the advantage of high durability and resistance in the water. Lightweight: Epoxy boards are a lot lighter, which gives the board around 15%-30% more floatability, helping with the paddling and speed in the wave. Flexibility and response: Epoxy boards have more flexibility as we´ve said before. This type of boards are recommendable for smaller waves. Polyester boards, on the other hand, are recommended for good surf condition (now wind). Ecological: Epoxy surfboards leave less contaminating substances during the manufacturing process than polyester boards. We leave this video for you where we sum up the advantages of epoxy boards and PU boards. The technology for 100% carbon uses a block of high density EPS (expanded polystyrene). Its covered with an imported carbon fabric and epoxy resin. The result of this mix gives the boards a lightweight that can be used in any type of board. Included Stand Up Paddle. The high resistance of the material protects the edges of the board. 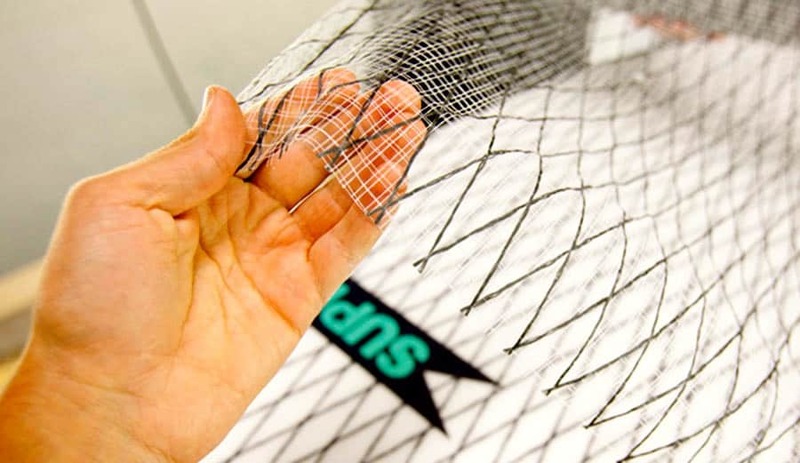 An example of this type of material is the new surfboard from Samsung Galaxy which we´ve talked about a while ago and also the ones with Johnny Cabianca as shaper. White polyurethane with glass fiber and polyether resin is considered standard material in the majority of brands for the last 50 years. The flexibility that this material gives is still praised by all shapers. Polystyrene (PS) foam is a lightweight material, but requires a lot of time to mold since it’s a very resistant product. The durability comes from the epoxy resin, since the PS is totally covered in it. Expanded polystyrene (EPS) is a new version of polystyrene that is gaining more and more popularity. It´s made of small balls of foam, like the ones used in packaging. It’s a little bit more sensitive from water absorption, so it can only be made with the help of machines. Fiberglass is used by the most demanding of surfers. The mix of resin and fiberglass gives strength and rigidity to the board. Some of the biggest brands in the surf industry use this type of material to differentiate their boards. Consequently they are more expensive also. Choosing the type of material for your surfboard is an important decision and can change the way you start this sport. That´s why, before buying anything we recommend that you follow the advice of a specialist which you can by contacting us. If you have any doubts you can leave us a comment also and we will help you. If you liked this post visit our #surfbase tag where you will find different articles to get you familiarized with everything surf. Also subscribe to our newsletter where you will get exclusive content.